Standing at the South Pole is the next-best thing to being on another planet. If you walk a few hundred yards away from the buildings that make up the National Science Foundation's research station, you see a featureless plain of snow and ice, most likely empty of living creatures larger than microbes for hundreds of miles. With nothing but snow for sound waves to echo off, there's an eerie silence. It's easy to get lost in reverie, contemplating the stark landscape. But then you remember that you're here for a reason: to work on what may be the world's weirdest telescope, searching for some of nature's most mysterious subatomic particles. Every second, more than 10,000 high-energy particles – protons and atomic nuclei – rain down on every square meter of the Earth's atmosphere. Some of them carry more than a million times the energy of the protons at the most powerful particle accelerator, CERN's Large Hadron Collider. Fortunately, the atmosphere absorbs most of them, but a few stray particles pass through your body every second – they're the reason intercontinental airline crews are classified as radiation workers. Scientists discovered these particles, known as cosmic rays, more than a century ago, before Einstein's theory of general relativity or Bohr's quantum mechanical model of the atom. But even today, despite half a dozen Nobel Prizes awarded for research related to cosmic rays, we're not sure where these particles come from. The magnetic fields that fill the universe deflect cosmic rays on their way to Earth, so the direction they're traveling when they reach us doesn't tell us where they were originally produced. Neutrinos are very strange – they've been called ghost particles. They very rarely interact with other matter, so to see them, you need a very large detector. Our telescope is called IceCube, because we use a cubic kilometer – a billion tons – of the Antarctic ice cap to catch neutrinos. Most neutrinos pass invisibly through IceCube, but by chance a few of them will smash into a proton or neutron in the ice, releasing a shower of relativistic particles we can see. By measuring the number and direction of these visible particles, we can determine the direction the original neutrino came from, its energy, and its type or "flavor." One by one, we build up a picture of the sky as it shines in neutrinos, rather than starlight. Antarctica may not sound like the obvious place to build such a telescope, but in fact it's the easiest and cheapest place to do it. The US maintains a scientific facility at the South Pole, home to several other experiments besides IceCube. 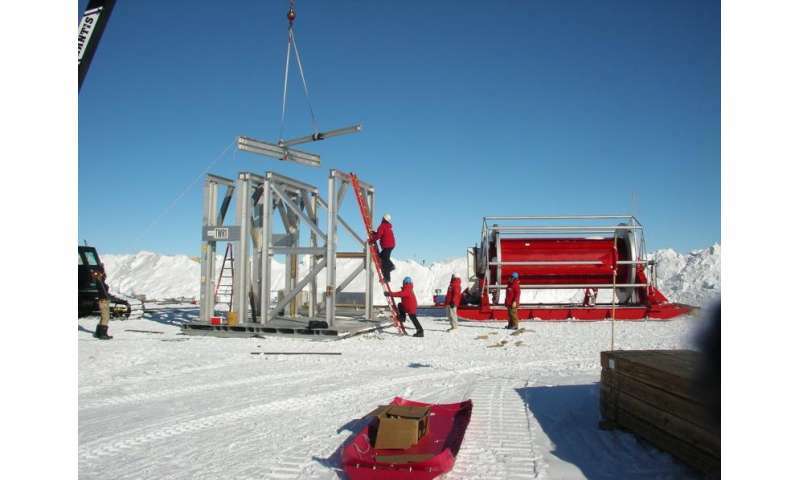 Most importantly for us, the South Pole station sits on top of nearly three kilometers of the purest, clearest ice in the world – a perfect neutrino target just waiting to be used. But "easiest" is not the same as "easy" – the South Pole is a challenging place to work. Traveling to the pole from the US can take a week or more. The last leg of the trip is on a special ski-equipped C-130 cargo aircraft operated by the Air National Guard, which lands on a runway made of compressed snow. These aircraft can only reach the pole for four months of the year: at midsummer (January, in the southern hemisphere), the average temperature is a balmy -15 degrees Fahrenheit (-26 degrees Celsius), but by March temperatures have fallen to -50F (-45C), too cold for C-130s to operate. We pack our work into those summer months, then hand IceCube off to two hardy "winter-over" scientists. Our winter-overs are part of a team of 45 people who stay at the station for the rest of the year, cut off from the rest of the world for eight months except for internet and radio communications. In the summer, the station population expands to about 150. The South Pole is a high-altitude desert, so the air is thin and very, very dry. But the cold isn't the toughest part of working at the South Pole – at least in the summer. The strangest thing, at least for me, is the constant daylight. At the South Pole, the sun stays up for six months, circling along the horizon and slowly spiraling down until it sets at the autumn equinox. Then our winter-overs get six months of constant darkness until sunrise in the spring. This plays havoc with circadian rhythms; I've awoken to see the clock read 3:00, not knowing whether it's am or pm, whether I've slept for four hours or 16. Despite being one of the most isolated places on Earth, the station is also very crowded in the summer. It takes a lot of expensive fuel to heat buildings, so space is at a premium, and needless to say most of us work indoors. It also takes fuel to melt water, so showers are rationed to two minutes of running water twice a week, contributing to the unique working atmosphere at the South Pole. After seven years of work, IceCube was fully commissioned in 2011, on schedule and on budget. Coordinating the efforts of around 250 scientists around the world was another challenge, and that was only the beginning. Most new telescopes are validated by observing known sources: stars, pulsars, radio galaxies. 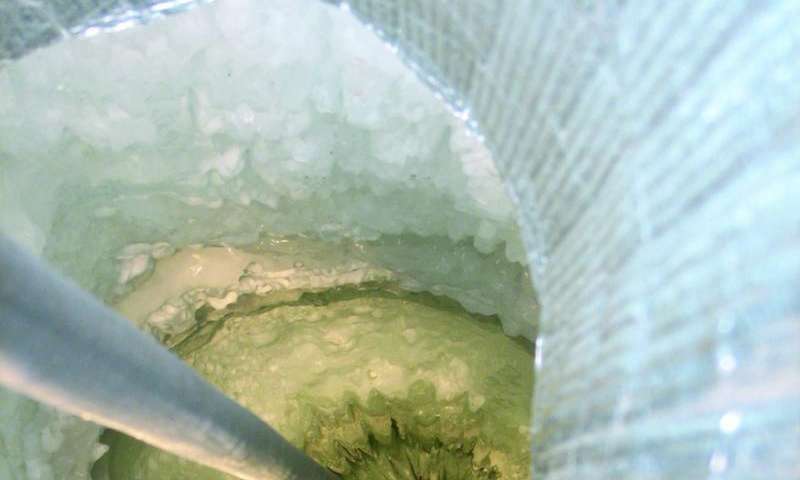 But there are no known high-energy neutrino sources – IceCube is opening an entirely new window on the universe – so we had to convince ourselves and the rest of the scientific community that we know what we are seeing. Two years after IceCube was completed, we announced that we had identified our first two neutrinos from outside the solar system – the first entries in our map of the neutrino sky. (We named them Bert and Ernie.) Last year we recorded the highest-energy neutrino ever seen: 1,000 times the energy of the protons accelerated at CERN. There's a wonderful debate in the scientific community over where these neutrinos come from, whether any of them might be produced in our own galaxy or even be related to exotic new particles like dark matter. As we take more data, we hope more exciting new discoveries are in store.